Setting a new standard for the Elise community! Most of the experienced Elise drivers base their brake pad choice on their personal experience. What you'd really be looking for are pads with low compressibility and which offer a very flat friction curve. Most important for everyone, experienced and unexperienced, you would want your Elise or Exige to brake reliably at the track without hassles. Spending £200 for a trackday means you want to be out on track. You don't want to spend time in the pitlane identifying or solving brake problems. "Will they fade during a half an hour session?" "Will my car get monster stopping power on track but a pain to drive on public roads? (cold brakes)"
"Will they cause juddering or vibration?" "How long will I be able to use a set of pads?" Most manufacturers will struggle to answer these questions and focus on the specific features of their product. Reducing some of the stopping distance might be extremely important on the last lap of a sprint race, but most of us are more concerned about all round stability. It's from this perspective that the CL Brakes Sintered Brake Pad line was developed. 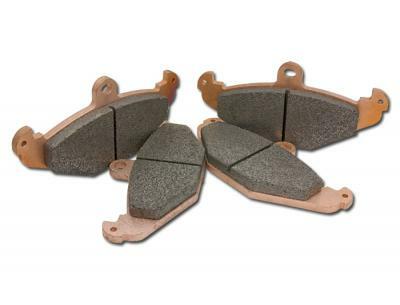 The objective is to provide the most user-friendly high performance brake pads available. Wouldn't it be nice if you didn't have to worry about bedding-in, vibrations, gobs of corrosive brake dust, and extreme pad and rotor wear rates? That's exactly what you can do with CL Brakes' new Sintered Racing Pads. CL Brakes, or Carbone Loiranne use Sintered material which has a higher coëfficiënt of friction/Mu when hot or cold versus competing semi-metallic, organic, or ceramic compounds. There is no need to warm-up to provide near maximal bite and performance. CL Brakes pads always offer the same performance.. hot or cold. CL Brakes pads need very little preparation to achieve maximum performance: only a few moderate stops after install to seat the pads on the rotors. This means no vibrations, judder, or damaged rotors. The thin graphite transfer layer is consistent, repeatable, and self-cleaning. CL Brakes mildest compound pads offer fade resistantance to over 650°C. It is nearly impossible to fade on an Elise or Exige. CL Brakes High metal content is extremely wear resistant. It is not uncommon to get 2 to 3 times more laps vs. other pad materials and types! CL Brakes Sintered material is semi-porous. Can be used in any weather condition with an added margin of safety: snow, rain, extreme cold and heat. Pores retain abrasive particles for superior wear rates. CL Brakes pad material is brazed to backing plate at 1000°C. CL Brakes pads offer greater density than other pad types, making it less compressible. This results in firmer pedal feel and makes it easier to modulate. CL Brakes pads are extensively track tested by various customers doing track days, but also by participants in the EliseTrophy and Lotus Cup Europe. Will you be the next customer to realise these perform better than the benchmark at lower pricing? RC8 is the most aggressive pad compound produced by CL Brakes. The first thing you'll notice about them is the incredibly high, yet controllable bite. You'll likely use less pedal pressure than you're used to. You'll also have incredible cold bite, which is of great value to sprint participants, who typically have little or no time to warm up their brakes prior to timed runs. Regardless of your engine package, tires, or the track you're driving, it's highly unlikely that you'll ever fade the RC8 compound. Since the material is so dense, the RC8 produces a rock hard pedal feel. Most experienced drivers have a 'wow' moment the first time they use RC8, as they've never felt anything quite like it before. RC8 is only available as a rear pad. Some people want more brake bias to the rear of the car and want to have pads with different friction levels. When you use RC6 on the front of your car and want more of the balance shifted to the rear, you will be able to use these pads to get there.